High deductible plans and new technologies are turning patients into savvy healthcare consumers, with higher expectations around service and experience. Companies are positioning themselves to take advantage of this shift. Over the past few years, industries from enterprise IT to financial services have become more consumer-centric. They’ve focused on improving product experience and creating customer-friendly policies in an effort to appeal to an increasingly informed, internet-savvy audience. In healthcare, that change has come more slowly. The healthcare industry faces high regulatory burden and health incumbents that have not recognized their businesses face an existential threat. But with the Affordable Care Act, higher deductibles, and new technologies, the consumer experience is becoming central to how healthcare companies are positioning themselves. From medical-grade wearables to chat-based telemedicine services to subscription primary care models, companies are placing bets on technologies to improve the consumer experience and make it more accessible, affordable, and personalized. In this report, we analyze how the healthcare industry is becoming more consumer-centric, obstacles to these new models, major players in the space, and how patients’ interactions with the health system could change going forward. It’s no secret that healthcare costs are going up. US expenditure on healthcare passed $3T last year and accounted for more than 17% of GDP. Meanwhile, the cost of healthcare is growing by $1000+ dollars per year on average for a family of four, reaching almost $27K in 2016, according to the Milliman Medical Index. One of the ways the government, insurance carriers, and employers hope to bring down costs is by making consumers better at shopping for their healthcare. 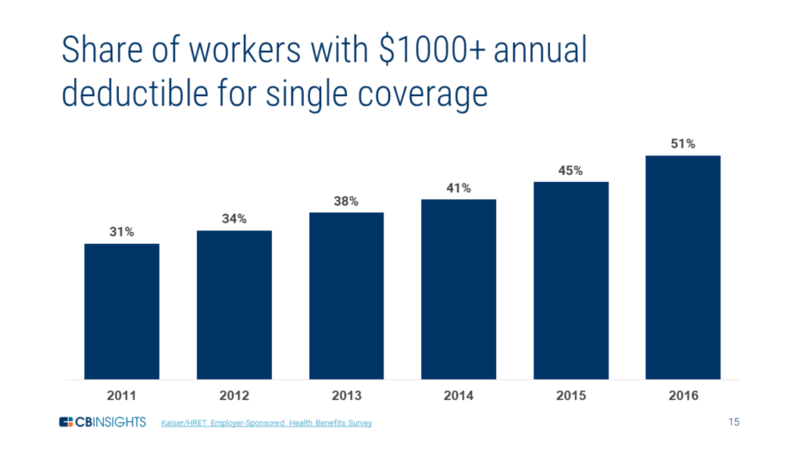 To encourage this, they have pushed people into more high deductible health plans. In other words, if consumers need to pay more out of their own pockets before insurance starts covering them, the thought is that they will become more price sensitive, carefully evaluating different options based on price, quality, and convenience. This is one of the big drivers in healthcare consumerization. 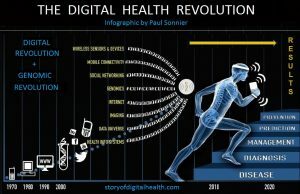 The profileration of mobile phones has also helped consumerize healthcare. Mobile allows people to monitor their health outside of hospital walls, especially through wearables, which collect data and sync to mobile interfaces for tracking and analysis. Mobile also creates an opportunity to develop new business models such as telemedicine, which allows for remote communication with physicians. In doing so, mobile lowers friction to obtaining care, as in many cases, you can reach into your pocket and access it anywhere and anytime at your convenience. Because of their expertise in building direct-to-consumer relationships and software proficiency, large tech companies are now seeing the opportunity in consumerizing healthcare. 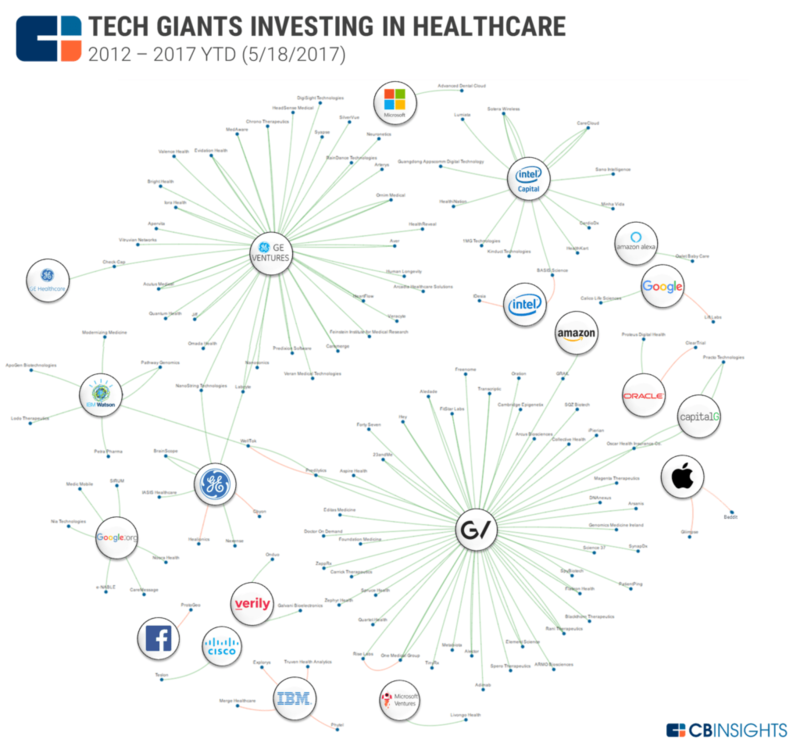 Companies like Google, Apple, GE, and others are increasingly investing in healthcare startups or focusing on internal initiativesaimed at healthcare innovation. A lot of these tech giants and startups that focus on the customer experience see primary care as the best place to enter the healthcare market since it’s the gateway for most people into the health system. There is also a significant shortage of primary care services, especially in rural areas. 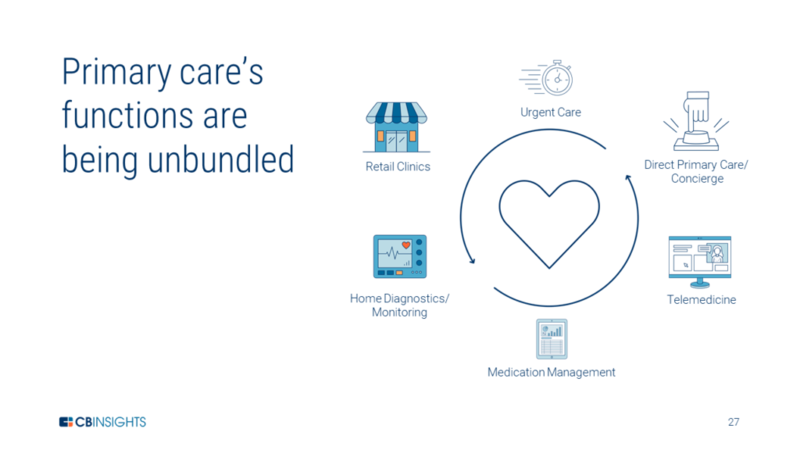 These companies see an opportunity to bring health-focused services to underserved individuals and develop new consumer relationships via technology. We’re increasingly seeing people enter the health system in new ways, and not just through traditional visits to a primary care physician or an emergency department. There are new avenues and tools available directly to consumers that provide more options for people depending on severity of sickness, ability to pay, and schedule. Before we get care, we need to recognize something’s wrong. With access to monitoring and diagnostic tools, consumers can proactively monitor their health and visit a medical setting when something appears off. Patient-generated data can come from diagnostics tests, wearables, direct-to-consumer medical devices, and genetics, among other sources. With more data coming directly from the consumer, healthcare professionals hope to be able to better assess patient risk and personalize treatment. But not all data is created equal, as seen with the difficulties Fitbit and Scanadu have had in the diagnostics and monitoring space. Fitbit has seen its stock slump as the company has failed to offer consumers’ actionable health data, while Scandau raised money to develop a diagnostics device but was ultimately unable to get approval from the FDA. If clinical grade data — or data usable in a medical setting — is key, these companies are going to have to go through regulated channels like the FDA. But greater regulation could be an asset. With FDA approval, providers are more likely to trust datasets coming from consumer devices. In tandem, we’re starting to see regulations expand and opportunities open up to accommodate many of these new devices and diagnostics tools. One seemingly small but far-reaching piece of legislation that recently passed was the “Over-The-Counter Hearing Aid Act of 2017.” This allows hearing aid makers to skip the physician and sell directly to consumers without a prescription. The FDA is creating a fast track for approving these lower risk wearables and tools that create clinical grade data, allowing them to be sold directly to consumers. 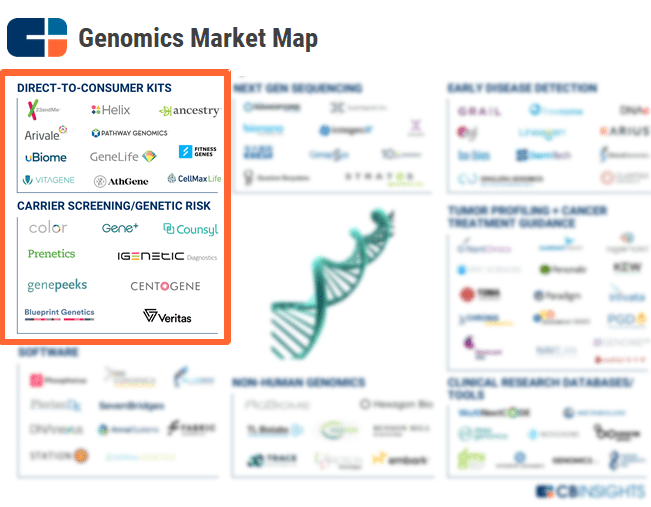 On the diagnostics front, 23andMe effectively helped create the category of direct-to-consumer genetic testing, with lots of startups now raising money in the direct-to-consumer testing and carrier screening markets. 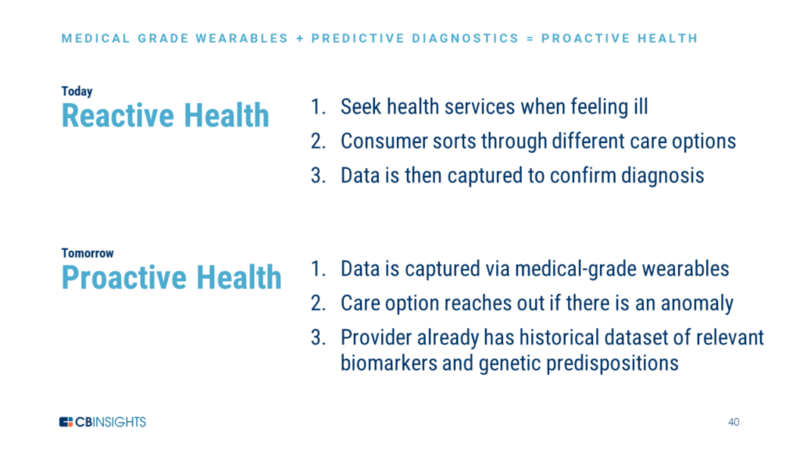 These companies are blurring the lines between diagnostic and predictive and also creating relationships directly with consumers. Now we have new genetic information, data from medical grade wearables, and FDA-approved diagnostics like Kinsa and Cue to detect temperature and hormonal changes for things like the flu, fertility, etc. All of these tools are enabling predictive medicine, and are allowing for patients and providers to use personalized data to impact healthcare decisions. This is the first step to moving towards proactive health and away from reactive health. Software can alert providers to anomalies in the data, and then they can reach out to a patient to confirm something’s unusual or wrong. This is very different from today where patients often wait until they feel sick to see the doctor. We’ve slowly seen retail clinics expand from distributing health goods to offering health services. Services include STD testing, vaccinations, microbial culture tests, and other preventive health tests. They’re also much faster than a primary care visit since most people know the specific reason they’re there, or the test they need. 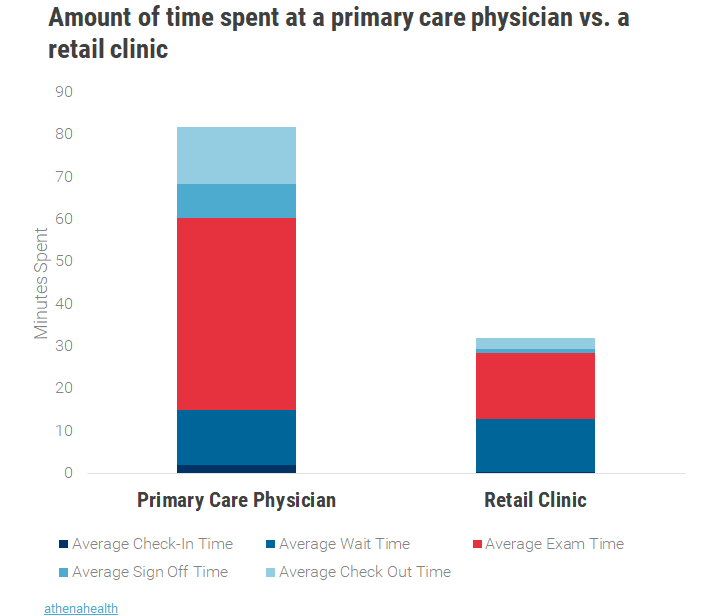 Retail clinics purposefully offer only tests that are faster to conduct, which reduces the exam time significantly. We’re seeing more and more in-house clinics like CVS MinuteClinic being built across Walgreens, Kroger, and Walmart stores, among others. This strategy is also one way for these retailers to Amazon-proof themselves by giving them a reason to come into the store. More companies see these retail clinics as new distribution avenues are finding ways to extend the types of care you can get at your local pharmacy. This includes introducing kiosks for telemedicine, more diagnostic tools to check temperature, weight, and biomarkers, among other services. But it’s also an area that’s tough to crack due to the expensive real estate clinics take up, the cost to maintain them, and the challenge in proving to pharmacies that these services actually get people in the door. We’ve seen some well-funded shutdowns like healthspot, but also notable partnerships with Pursuant Health rolling out in different Walmarts, and higi entering into a similar partnership with Rite Aid. The CVS-Aetna acquisition for $69B has put the spotlight on how retail clinics can be used in population health. CVS has talked about its desire to use digital tools to help its customers improve their health via a mobile app, medication adherence tools, and more. With this acquisition, it has the financial incentive to do so by being their insurer as well. This could force other retail pharmacies to respond. Several of them are already active investors in private markets, but this could spur them to make bigger and more ambitious plays. 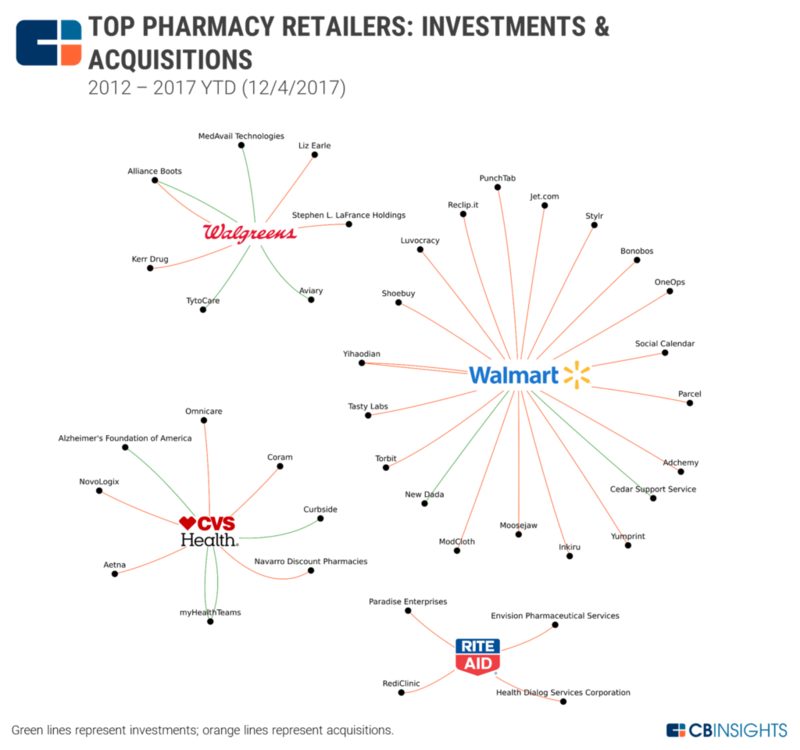 CVS itself has mostly looked to private markets to consolidate its core pharmacy business, but could look towards more telemedicine, health analytics, and medicine delivery tools to help manage the health of its population. We did a full analysis here. Urgent care has taken off by finding a sweet spot between the long wait times of a traditional primary care clinic and the expense of the emergency department (ED). Urgent care clinics can treat acute, but non-life threatening conditions that often don’t require an expensive ED visit. In many cases, patients can see doctors more immediately than in a hospital setting. While smaller in nature than EDs, urgent care clinics don’t need to invest in the expensive machinery overhead, staff, etc. and can also turn away patients if they’re uninsured (unlike the ED). The number of urgent care clinics is creeping up, a combination of increased patient demand due to their convenience and also an active effort by payors to keep people away from emergency departments unless they truly need ED services. As more of these clinics pop up, they’re forced to compete with each other on price, convenience, and customer experience. Urgent care companies have been a particularly attractive target for private equity investors, which see opportunities in streamlining operations, bundling different clinic chains, and standardizing processes and tools to make them more efficient. Warburg Pincus recently acquired CityMD at a $600M valuation. Direct Primary Care (DPC) and concierge medicine charge patients a retainer fee (on a monthly or yearly basis) for access to a specific doctor or clinic. Both rely on the concept of retainer fees and smaller patient panels compared to a regular family practice. Concierge medicine usually charges both the patient and insurance (making it subject to insurance and Medicare regulations) while Direct Primary Care only relies on the retainer fee (and can avoid insurance and associated regulations altogether). Both DPC and concierge use the retainer fee to lock patients in and create a recurring and predictable form of revenue for the clinic. Patients then get more time during visits and more access to the doctors, sometimes outside of typical hours. In many cases, the retainer fee includes testing costs, but some clinics charge patients for testing at a wholesale price without the usual mark up. These new clinics are trying to build as much as possible from the ground up, with most realizing that relying on third parties for services like patient records, billing, patient management, etc. can be large detractors of the consumer experience, which is what they’re selling. Companies like One Medical and Forward have built their own EMRs, apps, have lab testing in house, and also build tools for their physicians to better manage their patients. They’re also using employers for distribution, pitching a subscription to their clinics as a perk to employers for retention purposes. 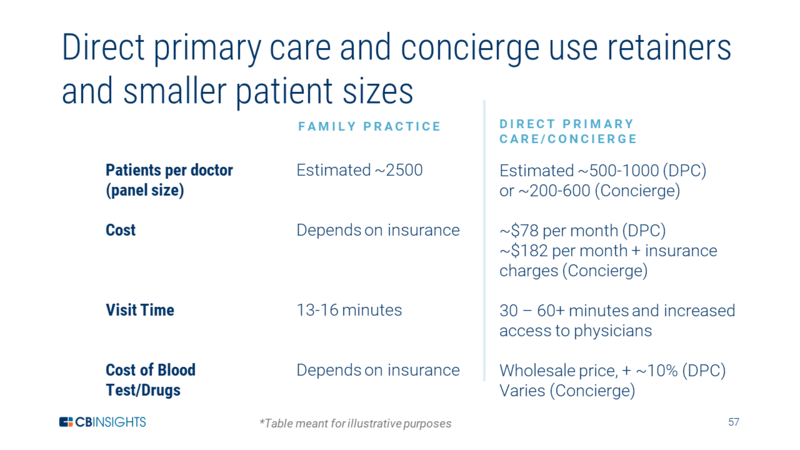 The direct primary care and concierge models are dependent on small patient panels to be able to provide consistent, high-quality, and high-touch care, making them difficult to scale. We’ve seen well-funded shut downs including Qliance, while other more popular clinics like One Medical are still private after more than 10 years. Calling All Businesses – Fill Your Key Positions and Solve Your Pressing Problems with our SkillQuo Experts, saving you time, money, and overhead!